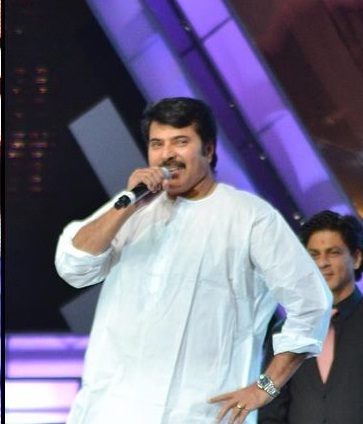 Mammootty was honoured with the Cultural Icon of Kerala award in the 14th Asianet-Ujala film awards distribution. The award ceremony took place on Friday, January 6th at Dubai festival city. Superstar Mammootty bagged the Cultural Icon of Kerala award. Mohanlal, Bollywood superstar Shahrukh Khan, Asin, Vidya Balan, Kavya Madhavan, Manoj K Jayan, Archana Kavi, Lakshmi Gopala Swami, Maneka Suresh Kumar and many other celebrities attended the grand function as well. Roma, Divya Unni, Manisha Lamba, Vidya Unni and Rima Kallingal performed at the Asianet-Ujala film awards. Kalabhhavan Mani, Benny Dayal and Rimi Tomi cheered the audience with their songs. Suraj, Jagadeesh, Jagathy Sree Kumar, Tini Tom, Kalpana and KPAC Lalitha presented various comedy skits. The award winners were given a statuette designed by artist Namboothiri along with a prize.